Focus: To learn to identify ways of your own and your clients' thinking to improve ability of behavioural change to achieve results. A ‘mental map’ is a way of thinking which generates our behaviour. If we can change our way of thinking, then it puts us in a good position to be able to change our behaviour. We construct our mental map based on our ‘filters’, which consist of our five senses, (what we see, hear, feel, taste and smell), our beliefs and values and our internal and external dialogue (language). We are, at any one given moment, exposed to around 2 billion bits of information. Our conscious mind is only able to deal with some of this information. According to research conducted by (George A. Miller 1956), this amounts to a meagre seven chunks of information PLUS OR MINUS 2 chunks. - i.e. nine bits if we are feeling good or have an interest in the subject, or as few as five bits of information if we are feeling low or not really interested. It is simply impossible for us to take it all on board so we need to filter this information, just like we would sift through our email inbox to filter out spam or junk mail. Consequently we delete, distort and generalise information and then create our own unique internal representation of what is happening. This is a bit like storing emails in certain folders and deleting the ones, which we perceive to be unimportant. The internal representations we make are bit like mini movies that play in our mind. These mini movies affect our state (the overall emotional, physiological and psychological condition of an individual), which affects our physiology or posture and ultimately our behaviour. To deepen our understanding of how we form our mental map, lets take a look at one set of ‘filters’ at a time. We have five senses and, in NLP, these are referred to as Representational Systems, or more commonly Rep Systems, Modalities or simply VAKOG. The term Rep System refers to which of our senses we are paying attention to. Are we more aware of what we are seeing (visual), or what we are hearing (auditory), or what we are physically sensing or feeling (kinaesthetic), or smelling (olfactory), or tasting (gustatory)? We pay attention to what is going on inside and outside of us through our senses. So, in an auditory sense, we can hear sounds outside of us and we can hear our own internal thoughts as chatter. Using the kinaesthetic sense we can pay attention to the feeling of hunger or satiety and we can feel the warm sun on our skin. Visually, we can see what is going on around us and we can make mental movies of situations past, present and future. When we walk into a cinema, we may become aware of the smell of popcorn and when we eat, our attention is on the taste of our food. It is important to understand that although our attention, at any given moment, will be a blend of all five senses; it is typical that one or two will have dominance in certain situations, for most people. Therefore, the way in which our clients ‘sense’ certain situations and events will have an affect on their behavioural choices. One of the first skills we need to develop, when learning NLP, is to recognise how a person is using their senses or 'representational systems'. We do this through listening to clue words and phrases called predicates. Beliefs and values are, more than any other element of our mental map, are at the root of change. Limiting beliefs keep us ‘stuck’ and empowering beliefs move us forward in life. Beliefs and values are created over a lifetime, many of them cemented from the constant pounding of messages from parental figures, teachers and peers until they have become such unconscious patterns, that its hard to believe otherwise about ourselves. “We all should value our health, but none of us really do, do we” – None of us? “I can’t see myself ever being able to do that” – Ever? “I’m a failure, I always fall at the first hurdle” – Always? “I’ll never be able to run that fast” – Never? Gently challenging limiting beliefs can help to challenge someone’s on/off switch about for their ability to do anything in the world. Consequently, beliefs and values affect all the behaviours in our lives and the decisions we make, sometimes with consequences we wish we could undo. They steer the rudder of our lives, influencing our attitude and decisions and hence our motivation and desires. In short, they drive our client’s behaviours that influence their health, fitness and wellbeing. If we want to change our client’s behaviours, then we need to gently challenge their limiting beliefs. A value can be acquired as easily as asking, “what is important to you?”. Values are what people typically move towards or away from. They are like ‘hot buttons’ that drive our behaviour. If we find out what someone’s ‘hot buttons’ are and keep pressing them, we are able to guide them towards their outcomes in life. 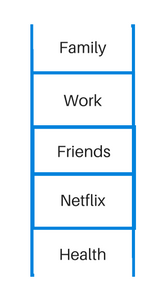 Values tend to have a hierarchy of importance, with those that we hold most dear being nearer the top and those of lesser importance lower down. Language is at the core of NLP. Language has an affect on our cognitive processing (thinking). The way we think is reflected in our language. Language patterns are a key component of the ‘Linguistic’ element of NLP. Our language both reflects and influences our mental map, including belief systems, values, attitude, state and sensory processing. “I can’t lose weight”; “I just haven’t got time to do that”; “I’ll never give up smoking”. Thus, language can parallel our thinking and our mental map, which helps us to identify areas for further exploration and coaching. There are certain words that we use, that are selected at an unconscious level, that reflect our way of thinking in terms of sensory processing, these words are termed as Predicates. I see what you are saying; that doesn’t look right to me; I’ve got to get clear on this; I just go blank; we need a new perspective. Predicates can indicate which sensory system a person is most conscious of. Communication between two visuals, two auditorie's and two kinaesthetic's is often seamless. It’s when these modes of thinking become mixed up that communication gets more interesting. Identifying, and matching predicates can help us to build a deep and unconscious level of rapport with our clients and, therefore, help us to influence change in behaviour. 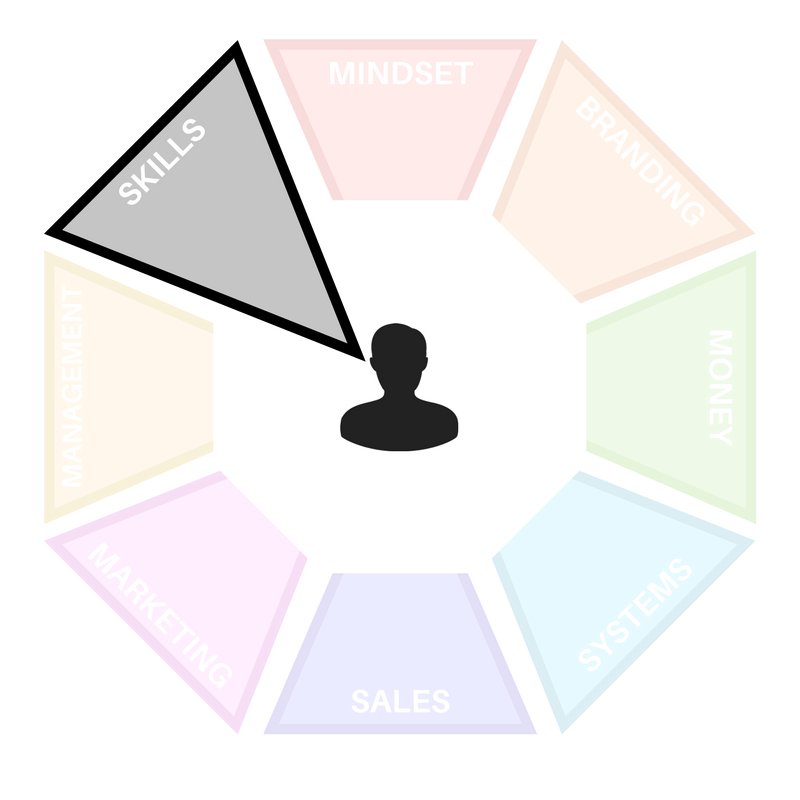 Using the metaphor of a simple circle to represent our mental map, we can identify the concept that our mental map is our ‘comfort zone’. Within the circle is everything we know, believe to be true about others, the world and ourselves. It represents all of our memories, experiences, skills, learning and values in life. We can think of the edge of our circle as the edge of our mental map or comfort zone. The area within the comfort zone provides us with a sense of safety since it is known and familiar. If what we are comfortable with is reflected within another person, then this is likely to create bonding and relationship as the maps cross over. Difference between mental maps can either cause us to learn and seek out a new interest or has the potential to create disagreement. If you have ever wondered why you just seem to ‘click’ with some people and yet others you seem to ‘bump’ up against then it is simply because of a cross over, or lack of cross over in mental maps. Knowing this can help us to build rapport with our clients by seeking similarity for bonding. In NLP, it is considered that all learning and development takes place at the edge of our map or comfort zone. The more we seek difference between our own mental map and that of others, the greater our chance of learning and expanding our own mental map. 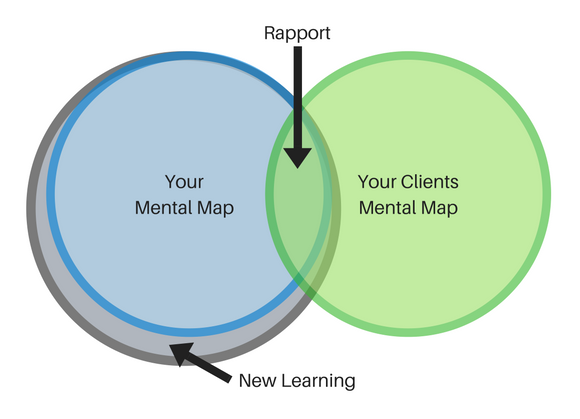 When working in a coaching situation with a client, it is important that we are aware, not only of the person’s mental map, but where the edges are. Stepping up to the edge of the comfort zone can be scary and unfamiliar for most people, unless, of course, they are an extreme sportsperson! We need to be able to coach and guide someone towards the edge, step by step, so that they can expand their ‘fitness’ map and broaden their awareness of their potential, beyond the edge. If we encourage people to leap outside of their comfort zone, and hope that a net will catch them, then we may just be ‘stretching’ them too much. Different people will be able to tolerate different degrees of stretch. The art of a good NLP coach is to decide how much stretch is enough. Body language is a big clue to this. Body language communicates something, regardless of whether we wish to communicate it or not. We cannot, not communicate. As humans we can modify our gestures consciously, making voluntary movements as well as displaying unconscious breathing shifts, skin tone changes and micro-muscle movements. We use our bodies to convey interest or disinterest, to establish rapport with others or to stop them in their tracks. For many years body language has been studied in relation to how the human mind works and we have sought to make connections between physical movement and emotional, cognitive processes. These connections can tell us a great deal about someone’s state. We do things with our eyes, our mouths, our hands and our bodies in general if we want to achieve certain ends. This can be anything from letting someone know we like them right through to making it plain that we do not want to speak with them. Body language can say as much in movement as the mouth can in words. The problem with unconscious body language is that it can sometimes reveal things that we – as individuals – do not want revealed. For example if we are nervous about something we might absentmindedly bite our fingernails or continually drum our fingers on a desk or fidget uncomfortably in our chairs, the list is endless for the physical movements. If someone is being stretched too far outside of their comfort zone, whilst personal training, then this can result in reddening of the skin, tightening of the muscles, poor technique and posture, and the display of facial expressions as if they are a rabbit faced with the headlights of a car! The conscious mind is like a vast library of books that stores shelf after shelf of our memories, experiences and feelings where space is limitless. Conversely, the conscious mind is a bit like the librarian who can locate and read to up to nine book titles at any one time, if she is interested in those books. If she wants to read any more book titles then she will have to put some of the others back on the shelf. On a day when her attention is more challenged then she may only be able to read 5 or perhaps even just 3 book titles at a time. As mentioned previously, according to research conducted by (George A. Miller 1956), the conscious mind is only able to be aware of seven chunks of information PLUS OR MINUS 2 chunks. 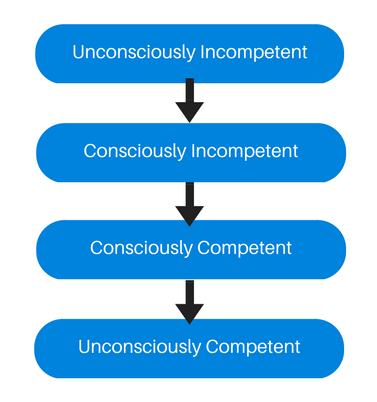 The Conscious Competence model Howell, W.S. (1982) is a useful model to remind us how we learn in stages. We don’t know what we don’t know. At this stage we are blissfully ignorant and unaware of any lack of skill or competence in this area. For example, at the age of 4 we are not aware that we don’t have the skill to tie our shoelaces because our parents or guardians probably did it for us. work out how to manoeuvre the laces around our fingers. We probably get it wrong more times than we get it right. Through some practice, we become competent at tying our laces, even though we still have to place our conscious awareness on the task and concentrate. Through repetition over time, we train ourselves to tie our laces quickly and effortlessly, with little or no conscious awareness. We get to a stage where we ‘just do it’. At this stage the learning has been generalised up into a skill that becomes a programme stored in our unconscious mind. People will often say at this stage that ‘it just clicked into place’ or ‘it was like the light-bulb came on’. A new neuro network has been formed in the mind. Exploring a person’s mental map is, in essence, exploring the unconscious programmes that control their behaviour. The programmes that they are not, necessarily, aware of. If the programmes that they run are useful and positive, then we can leave well alone. If, however, their programmes make them participate in unhealthy or negative behaviour, then exploring their metal map with the NLP toolkit helps to explore opportunities for change. If they don’t use our already ‘wired’ programmes then they will lose them over time. In other words, they can break habits. The majority of NLP techniques available will help us to ‘short circuit’ the already ‘wired’ programmes and help our clients to shed their negative behaviour.